By upgrading to Microsoft BizTalk Server 2016 your organization will reap the benefits of enhanced productivity tools, powerful security, compelling auditing features and more. 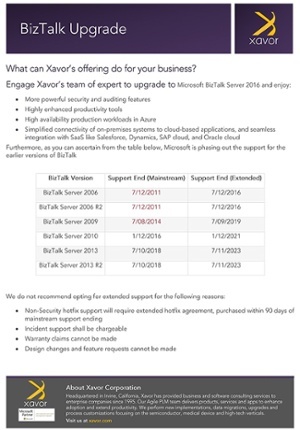 Xavor’s BizTalk team has performed dozens of BizTalk upgrades over the years by virtue of which we have developed a set of repeatable frameworks, or accelerators, that allow us to upgrade your BizTalk Server in no time. Evaluation of Enterprise-level strategy: We start by analyzing the specific needs of your organization to determine whether you should opt for an on premises, cloud, or hybrid solution. Existing IT Systems Evaluation: We also evaluate the existing systems and hardware to determine whether a direct upgrade is possible. If not, we will recommend the additional software/hardware that needs to be procured based on your organizational requirements. To help companies seamlessly upgrade and maintain BizTalk Server, we offer clients the option to purchase our bundled upgrade and managed services offerings. With a one-year service agreement we upgrade your environment for free. We work closely with your organization’s internal IT experts to ensure BizTalk Server implementations are designed, developed and monitored in the best way possible. Please note that the installation of the base software is the customer’s responsibility.